IanHorseon July 1, 2015 June 21, 2018 Leave a Comment on Stay Awake! Sometimes I don’t want my computer to go to sleep. Sometimes, I don’t want my messaging program to set to away. Sometimes, I want to appear like I’m actually working. Here’s my solution! 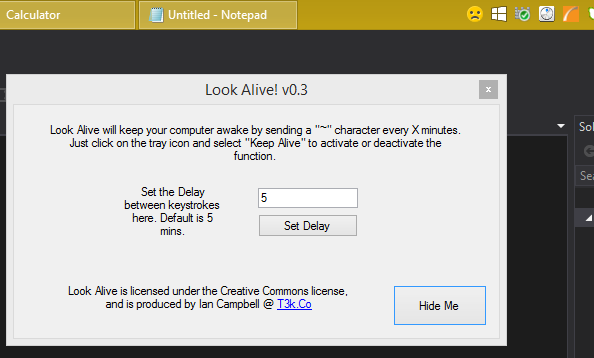 I wrote this lil’ program called Look Alive! (low bridge) to keep my machine awake. It sends a tilde every X seconds as specified in the settings page. Super simple, and no install required. Just run the .exe. If you press the HideMe button, the whole program hides in your tray waiting for you to activate the stay awake feature. Once again, since I write these myself, they are guaranteed virus/malware free!